In the long run, a higher rate of economic growth implies a higher share of investment in income. This will necessarily correspond to a lower combined share of other forms of spending. Knowledge of this point sometimes leads to unfortunate calls to cut back government spending as a means of boosting growth. Yet, if private investment can be said, in a long-run context, largely to be induced by income – which is consistent with the evidence (see, for instance, here, here and here) – then a sustained increase in the growth rate of government spending and other components of autonomous demand could be expected, through their direct impact on income, to induce higher investment. It is not at all obvious that the investment share in income would fall as a result of this process. To the contrary, there is reason to expect the investment share to rise and the share of other spending (and quite possibly government spending) to fall in consequence of demand-led growth of this nature. The purpose of the present post is to explain this possibility. The argument is a bit technical. It follows from analyses of the ‘Sraffian supermultiplier’ and is one point emphasized in recent papers by Girardi and Pariboni (here) and Serrano and Freitas (here). The first of these papers presents some empirical support for the argument as well as for demand-led growth in general. In these papers, growth is considered to be driven by those components of autonomous demand that do not directly create private-sector productive capacity. In the demand-led growth literature, this kind of demand is sometimes called Z. In general, it comprises government spending, autonomous private consumption expenditure (including some expenditures classified as investment in the National Accounts, such as purchases of new residential housing) and exports. An increase in the growth rate of this type of demand, by exogenously raising the growth rate of total demand, tends to lift rates of capacity utilization as firms adjust output to demand at given prices. If the change in demand conditions is long-lasting, so that rates of capacity utilization remain high, firms will be induced to install additional plant and equipment. It is assumed that the economy is within resource limits and that there is an ample supply of labor, so that capacity can be expanded in response to persistently strong demand. The presentation in this post follows the two papers just cited. There are a couple of minor differences. One is that the economy considered here is simpler, with the focus specifically on government spending and private investment. Another is that the model is presented in discrete rather than continuous form. This is less convenient mathematically, but may be a little easier to follow for some readers. It also helps us to see the dual nature of private investment, which has an immediate impact on demand and a delayed effect on productive capacity. The exogenously given parameters c and t are the marginal propensities to consume and tax. For simplicity, they are assumed constant through time. The marginal propensity to invest, ht, is determined endogenously (to be explained). Note that ht = It /Yt is also the investment share in income. All variables are functions of time. where α = 1 – c(1 – t) is the marginal propensity to leak from the circular flow of income to taxes and saving. The expression shows equilibrium income to be a multiple of government spending, where 1/(α – ht) is referred to as the ‘supermultiplier’. For output and growth to be considered demand led, it is necessary that α > ht and Gt > 0 (or, more generally, Zt > 0). Here, Δh = ht+1 – ht is the change in the investment share from time t to time t+1. It represents the behavior of the investment share through time. The coefficient γ is a positive constant. It indicates the responsiveness of the investment share to deviations in the rate of utilization ut from its normal rate ut = 1. When the rate of utilization is above normal (ut > 1), the right-hand side of (6) is positive and the investment share in income rises (Δh is positive). Conversely, when ut < 1, investment is discouraged and its share in income falls (Δh is negative). The adjustment process is considered to be gradual (meaning γ must be small). 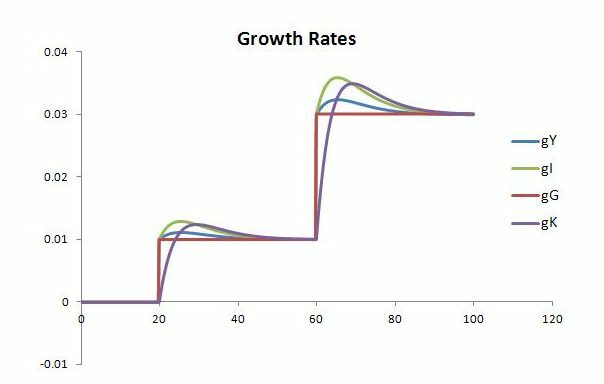 Intuitively, it seems clear that since u = Y/Yn, changes in u will depend upon the relative growth rates of actual output Y and normal output Yn. This suggests that it will be helpful, in the first term on the right-hand side, to relate Yt+1 to Yt and, in the second term, to relate Ynt to Ynt+1. We can do this by multiplying the first term by Yt /Yt = 1 and the second term by Ynt+1 /Ynt+1 = 1, which leaves both terms unchanged. The change in a variable divided by the initial level of that variable is its growth rate. So, here, ΔY/Yt is the growth rate gt of actual output over period t. Similarly, ΔYn /Ynt is the growth rate gnt of normal output over the same period. The rate of utilization increases (Δu is positive) when actual output grows faster than normal output (gt > gnt). Intuitively, we might have guessed Δu = ut (gt – gnt). In fact, this is correct for the continuous case. The behavioral assumptions and equilibrium conditions outlined in (1)-(7) suggest a demand-led growth process. We can see this by considering the way in which actual output changes over time. 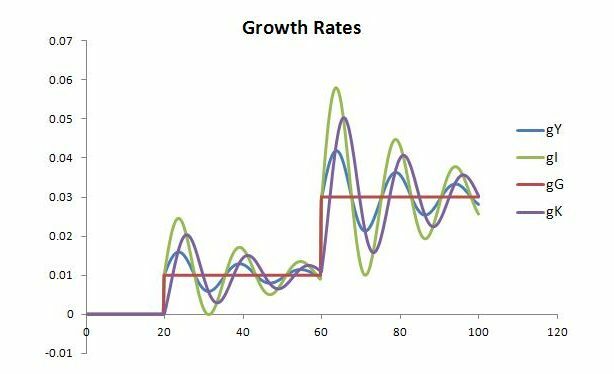 It takes a bit of work, but we can manipulate (1′) to arrive at an expression for the growth rate of actual output. At this point, it is useful to add –htYt+1 + htYt+1 (= 0) to the right-hand side. This will enable us to convert more terms into changes (symbolized by Δ). This says that gt, the growth rate of the economy as a whole (both of actual output and total demand), depends upon the growth rate of government spending gGt plus the rate of change of the supermultiplier (which is the second, fractional term on the right-hand side). The supermultiplier varies over time as the investment share h changes (according to (6)) in response to demand and deviations of the utilization rate u from normal. Over short or medium time frames, Δh will usually differ from zero (because ht+1 will not equal ht). When this is the case, the last term in (8) will be non-zero and the bracketed part of the first term on the right-hand side will differ from one. As a result, there will be no logical necessity for a higher gGt to correspond to a higher gt. However, in the long run, if gGt were held constant and firms, hypothetically, were given enough time to adjust capacity to demand, the rate of utilization would eventually settle down to normal (ut = 1). At that point, there would be no tendency for the share of private investment in GDP to change. Referring back to (6), in which Δh = htγ (ut – 1), Δh would then be zero, due to ut being equal to 1. The economy’s growth rate in (8) would then match the growth rate of government spending, with the bracketed part of the first term on the right-hand side equal to one and the second term equal to zero. This suggests that the economy’s growth rate tends to increase with the growth rate of government spending. This result holds, within the model, as a long-run tendency. It is not something that holds at every point in time. When utilization is above normal (ut > 1), private investment grows faster than actual output (and total demand). When utilization is below normal (ut < 1), private investment grows slower than actual output. Only in a fully-adjusted position, in which ut = 1, does private investment grow at the same rate as the economy as a whole. The behavior of private investment has implications for the growth rate of the capital stock K. Assuming that the ratio of normal output to capital θ (= Yn /K) is constant, these implications will also apply to normal output Yn. This says that net investment (gross investment minus depreciation) results in an increment to the capital stock. The effect occurs with a delay. Here, the capacity effect of investment is assumed to lag behind the demand effect by one period. According to these expressions, the capital stock and normal output grow more rapidly when the investment share ht and utilization rate ut are high. The growth of both lags behind the growth of demand and actual output. Reference has already been made to so-called fully-adjusted positions. These are the positions that an economy would eventually reach if the growth rate of government spending (or, more generally, the growth rate of non-capacity-creating autonomous demand Z) remained constant for long enough that firms had time to adjust capacity completely to demand. Of course, every time the growth rate of Z is perceived to change in a persistent way, the economy will be set off on a different notional growth path. The economy will never actually reach a fully-adjusted position. These positions are a theoretical construct intended to shed light on growth tendencies. A fully-adjusted position describes, at any point in time, the growth rate to which the economy is notionally tending given the current behavior of Z. In the model, a tendency for the economy to converge on a fully-adjusted position is assured provided the conditions for demand-led growth are met. These conditions, mentioned earlier, are that α > ht and Gt > 0 (or, more generally, Zt > 0). For the first of these conditions to hold, the speed of adjustment cannot be too rapid (that is, γ cannot be too large). When the two conditions are satisfied, the growth process is said to be ‘dynamically stable’. A formal stability analysis can be found in the paper by Serrano and Freitas (pp. 9-12) linked to at the beginning of this post. In a fully-adjusted position, there is no tendency for either the investment share ht or utilization rate ut to change. In other words, Δh and Δu will both be zero. The first condition (6”) is satisfied when the rate of utilization is normal (ut = 1). Substituting this equilibrium value for ut into (7′) gives a growth rate for the economy as a whole, gt, equal to the growth rate of normal output, gnt (and of the capital stock gKt). By (8) and (9), government spending and private investment will also grow at this same rate. That is, in a fully-adjusted position, gGt = gt = gIt = gKt = gnt. At this point, capacity and normal output will have finally caught up with demand and actual output, and so will be growing at the same rate as these other variables until something happens to disturb the growth rate of government spending (or Z). This is the investment share in income that tends to be brought about by the demand-led growth process. Noting that the rate of depreciation δ and the normal output-to-capital ratio θ have both been assumed constant, the expression shows that the investment share ht tends to rise with the growth rate of the economy gt and the growth rate of government spending gGt. We are now, at last, in a position to relate the growth rate of government spending to the shares of private investment and government spending in income. All elements on the right-hand side of (12) are constant. As anticipated, an exogenous increase in the growth rate of government spending gGt is associated with a smaller share of government spending in income (Gt /Yt). The causation suggested by the model runs from government spending to actual output (and total demand) to induced investment. An increase in gGt lifts the rate of output growth gt and pushes utilization beyond normal, accelerating the growth rate of investment gIt. In this simplified version of the model, the economy tends toward a situation in which private investment, the capital stock, normal output and actual output all grow at a rate that is determined by the growth rate of government spending. More generally, when we include other components of non-capacity-creating autonomous demand Z in the model, the economy tends toward a growth rate determined by the combined behavior of all components of Z. Inside resource limits, the economy grows faster when Z grows faster. When this occurs, the share of private investment in total income will rise and the share of Z in total income will fall. There is more leeway for the share of government spending in income once we include all components of Z. It is then possible that Gt /Yt could rise or fall with gGt, depending on the behavior of other components of Z. But the basic point remains; namely, there is no contradiction in a higher growth rate of government spending translating into more rapid economic growth alongside a higher investment share and lower government-spending share in income. We have seen, in our simplified model, that a faster growth rate of government spending gGt results in a higher investment share ht and lower government-spending share (Gt /Yt). Expression (8) says that when the investment share is rising (Δh > 0), actual output and total demand grow faster than government spending (gt > gGt). Now, from (6), we know that the investment share rises (Δh > 0) when utilization is above normal (ut > 1). When this occurs, investment, according to (9), will grow faster than actual output (gIt > gt). Putting all this together, when the rate of utilization exceeds normal (ut > 1), the investment share rises (Δh > 0) and investment grows faster than actual output, which in turn grows faster than government spending (gIt > gt > gGt). In other words, when there is an exogenous increase in the growth rate of government spending, this causes investment to grow faster than income so that the level of investment rises relative to the level of income. As a consequence, the investment share (ht = It /Yt) rises. At the same time, the demand effects of the acceleration in the growth rate of investment cause income to grow faster than government spending. This causes the level of government spending to fall relative to the level of income. Accordingly, the share of government spending in income (Gt /Yt) falls. Suppose that for 20 periods (defined as years) the economy is stationary, with output, demand and the capital stock constant rather than growing. Then, at time t = 20, there is an exogenous increase in the growth rate of government spending to 1 percent per annum (gGt = 0.01). Government spending continues to grow at this rate for 40 periods. Then, at time t = 60, there is another exogenous increase in the growth rate of government spending, this time to 3 percent per annum (gGt = 0.03). Two cases will be shown. 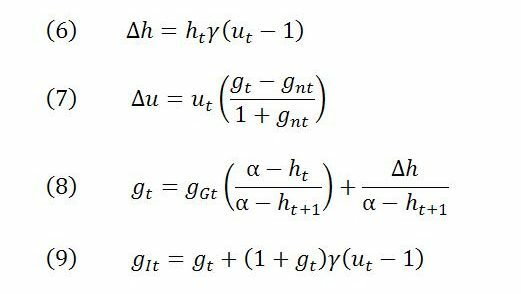 They differ only in the speed-of-adjustment parameter, γ. In case 1, γ = 0.02. In case 2, γ = 0.1. Case 1: γ = 0.02. The figure below shows the behavior of the growth rates of investment, actual output and the capital stock in response to the behavior of government spending. The capital stock (and also normal output) adjust with a lag due to the demand effect of investment being felt before the capacity effect. The adjustment takes place without noticeable cyclical fluctuations in the growth rates because γ is very small. The next figures show the behavior of the investment share ht, the government-spending share (Gt /Yt) and the rate of utilization ut. Note that the vertical axis does not start at zero. This is to highlight the changes in the variables. The government-spending share drops from 30 percent to about 28.3 percent. The investment share rises from 20 percent to about 21.5 percent. As discussed, exogenous increases in gGt cause the investment share to rise and the government-spending share to fall. The response of investment is due to the behavior of the utilization rate, which on average is above normal for the duration of the transition period, before eventually settling back to normal. Case 2: γ = 0.1. When γ is larger (but not too large), the growth rates (other than gGt) cycle around the growth rate of government spending in a ‘damped’ manner (meaning the cycles get smaller in amplitude over time) until converging on gGt. Likewise, the investment and government-spending shares also cycle toward their new levels. The utilization rate fluctuates around an average during the transition period that is above normal before settling back to normal once capacity has been fully adjusted to demand. You can get an idea that the average utilization rate is above normal during the transitional phase by noting the peaks (high points) and troughs (low points) in the successive cycles. In particular, the peak of the utilization rate in each cycle is further above 1 than the troughs are below 1. This causes the share of investment to rise as firms attempt to adjust capacity to demand. A good place to start is Serrano, 1995, The Sraffian Supermultiplier. Similar conclusions to those discussed in the present post can be reached from a Kaleckian starting point once the role of non-capacity-creating autonomous demand is taken into account. See, in particular, papers by Allain (here) and Lavoie (here). A helpful survey of the demand-led growth literature is provided by Cesaratto (here).